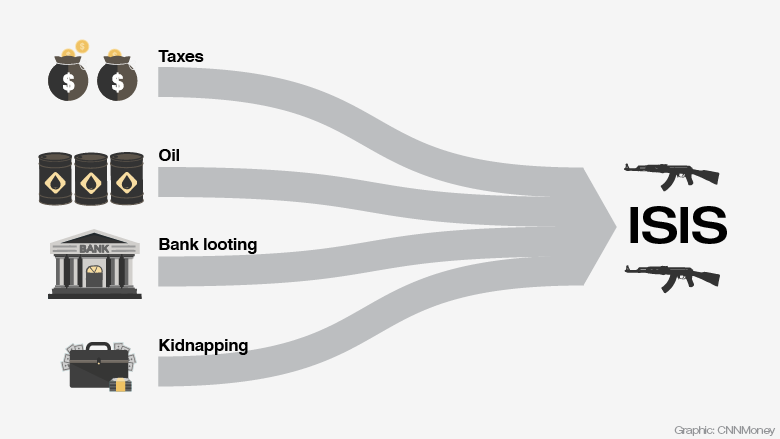 We know -- in surprising detail -- how ISIS pays for its reign of terror. ISIS buys bombs and pays fighters with the billions of dollars it makes from the oil fields, mineral mines, and banks under its control. ISIS also imposes taxes on the people living inside its territory in Iraq and Syria. ISIS raked in $2 billion in 2014 alone. CNNMoney has interviewed military scholars and financial investigators, and it has reviewed dozens of reports from ISIS, the U.S. Treasury, Defense Department, United Nations, British government, and several terrorism research institutes. Together, they show why ISIS is so powerful. It ditched Al-Qaeda's old model of relying on rich donors in the Arabian Gulf. Instead, the Islamic State is a self-funded powerhouse. ISIS subsidizes bread for the public, experts say. Soldiers earn $400 to $1,200 a month, plus a $50 stipend for their wives and $25 for each child, according to the Congressional Research Service. Highly skilled engineers and technicians can make upwards of $1,500 a month, according to an investigative team of UN researchers. "The Islamic State is certainly the best financially endowed terrorist organization in history. That is particularly due to its ability to govern ungoverned spaces," said Andreas Krieg, a military scholar at King's College London in Qatar. Here's how ISIS pays for it all. ISIS says all taxes are zakat, Islamic religious alms similar to a Christian tithe. But ISIS also extorts its residents at every corner. Schoolchildren must pay monthly fees: $22 for elementary students, $43 for older kids and $65 for university students, according to congressional researchers. These are fees residents didn't have to pay before. It costs anywhere from $200 to $1,000 to bribe ISIS guards when traveling on Iraqi roads into their territory, according to congressional researchers. There's even a special tax on Christians, mafia-like "protection insurance" called jizyah. The Islamic State's official magazine proudly speaks of "imposing jizyah." ISIS has also figured out how to apply special taxes to siphon money away from the legitimate Iraqi government, according to the Financial Action Task Force, which tracks terrorist financing. There are Iraqi government employees living in the northern part of the country that ISIS has taken over. ISIS lets these workers go to the nearby city of Tikrit to pick up their salaries. But they pay a 50% income tax on the way back into ISIS territory. And if you try to leave ISIS land, say, to visit family? The Islamic State demands a $1,000 departure tax and temporarily claims all of your property -- just in case you plan to plan to leave permanently, according to the Geneva Centre for Security Policy. Altogether, these taxes and fees brought in $360 million in 2014, according to a study by terrorism experts Jean-Charles Brisard and Damien Martinez. They estimate it could be even higher in 2015 - as much as $800 million. ISIS can also squeeze money out of the many businesses operating in that region. ISIS controls one-third of Iraq's wheat and barley, according to the UN Food and Agriculture Organization. It frequently steals agricultural machines and rents them back to farmers. The terrorists also took over a huge phosphate mine, phosphate and sulfur plants, and cement-making facilities. Together, they can produce upwards of $1.3 billion a year, according to Brisard and Martinez. ISIS can claim some or all of that, potentially doubling or tripling its tax and extortion revenue. "ISIS's most valuable asset and center of gravity is the terrain it holds in Iraq and Syria. Taking that territory away... is the most vital thing we can do," said Harleen Gambhir, a military scholar at the Institute for the Study of War. ISIS has hijacked oil wells and refineries. But it doesn't have the expertise or equipment to properly manage it at full capacity. Numbers are all over the place. But the best estimates say ISIS in 2014 was producing close to 50,000 barrels per day, less than half the region's potential. And it was still raking in up to $1.6 million daily, according to the UN. International sanctions prevented ISIS from selling this oil legally, so it has resorted to unregulated underground markets. But that's not hard. ISIS tapped into long-established smuggling routes that were set up back in the 1990s. Back then, Saddam Hussein used them to circumvent United Nations sanctions. 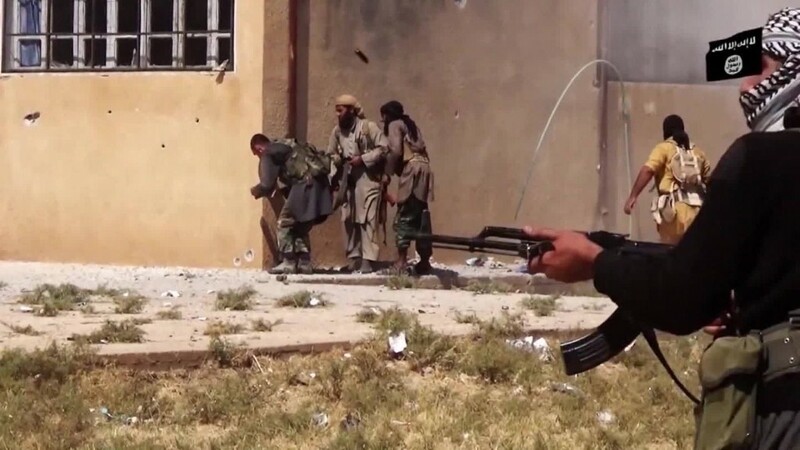 ISIS draws crude oil from captured wells. It sells that to middlemen at a quarter of the market price. When oil was at $80 a barrel last year, ISIS was selling it at $20 a barrel, according to the Financial Action Task Force. ISIS is selling oil to its enemies. Syrian dictator Bashar al-Assad needs oil to keep lights on his part of the country. U.S.-backed Syrian rebels need diesel to keep engines running. ISIS doesn't mind literally fueling its enemies for now, because its goal is to keep funding the expansion of the Islamic State -- in any direction -- said Christina Schori Liang, senior fellow at the Geneva Centre for Security Policy. "They have to keep the war economy going, because they don't have legitimate economies," she said. "The problem with war is everything is very blurry. They fight in the day and make deals at night." Last week, Russia publicly accused the Turkish government of tacitly allowing an illegal oil trade that brings $1.5 million of oil into Turkey every day. Turkey's president denied those claims. While oil is still an important source of ISIS income, it's no longer number one, according to the U.S. Defense Department. The U.S.-led coalition airstrikes that started in September 2014 have severely crippled the ability for ISIS to transport and refine oil. 8,573 strikes have hit 260 "oil infrastructure" targets, as well as thousands of fighters, buildings and equipment, according to the Defense Department. In October, they helped the Iraqi army take back the huge Bayji refinery from ISIS. Without massive refinery facilities, ISIS has resorted to using small, mobile refineries that can produce up to 500 barrels per day. But the coalition is bombing those too. In the 45 days leading up to Oct. 21, remotely-piloted drones, U.S. bombers and Saudi jets hit 30 of them. Now, ISIS can only produce and smuggle a fraction of what it used to. Rock-bottom oil prices limit that revenue even further. 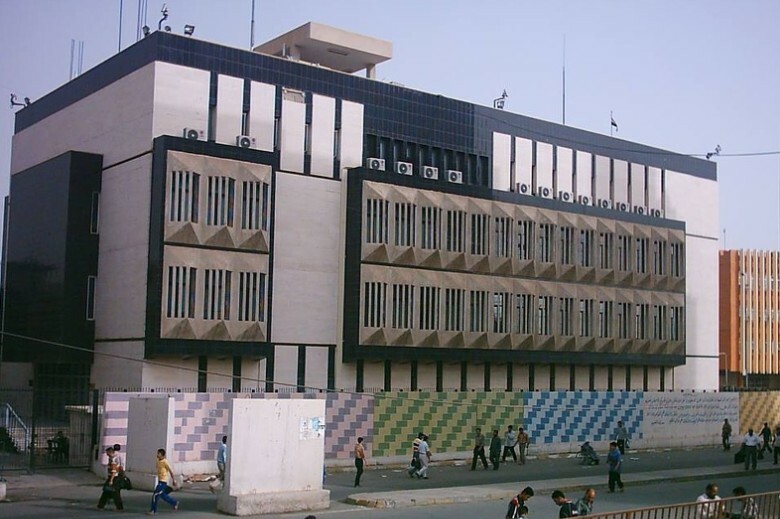 This is Mosul's central bank branch in 2013. 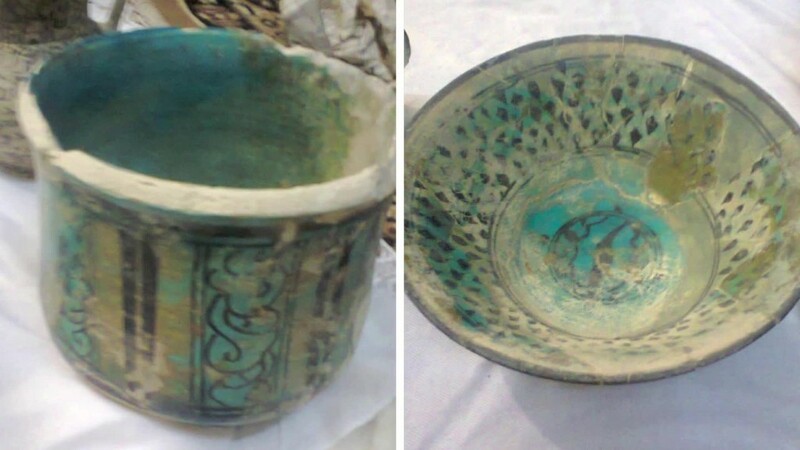 The photo was shared by Mosul Photos, a community project to archive photos of the beleagured city. When ISIS gains new territory, it claims control of banks. In 2014, the Islamic State stole up to $1 billion from banks this way, according to the U.S. Treasury. "Importantly, though, this source of revenue is not renewable," a Treasury representative said. But that one-time injection of money made ISIS the wealthiest terrorist organization on the planet. ISIS treats private banks and state banks differently. It's trying to build a functioning country, so it needs to maintain some sense of normalcy for the people stuck there. For example, ISIS doesn't touch the money in private banks -- it would rather tax that cash as people withdraw it. But Iraq's central bank branches get looted. When ISIS overran the Iraqi city of Mosul last year, it seized an estimated $450 million in cash and gold from the central bank branch there. ISIS now claims it's using gold to mint its own gold coin currency. American journalist James Foley was kidnapped in 2012, and ISIS demanded $132 million. It wanted $200 million for two Japanese hostages, Kenji Goto Jogo and Haruna Yukawa. Neither country paid, and both were murdered on video. Most countries stick to a UN resolution to not fund terrorists this way -- under any circumstances. It's an agonizing decision to make. Don't pay, and family members watch loved ones die. Pay up, and you buy terrorists weapons that kill thousands more. Plus, you give incentive for them to do it again. But some nations do pay ransoms. One by one, Foley's cell mates in Raqqa, Syria were released because their countries paid for them. French, Italian and Spanish hostages were freed, according to a New York Times investigation last year. ISIS collected $20 million to $45 million this way in 2014, according to the U.S. Treasury. But the vast majority of people kidnapped and tortured aren't foreign aid workers and journalists. They're local Assyrian Christians and Yazidi people. Yazidis live in the region and have their own religion. ISIS punishes them for not being Sunni Muslim. ISIS regularly grabs Yazidi family members, then demands $3,000 payments overnight, according to the Geneva Centre for Security Policy. ISIS has kidnapped hundreds of Assyrian Christians, sometimes releasing them for $1,700 each, according to AFP. "Kidnap-for-ransom" is a less lucrative part of the ISIS terror business. But its corporate approach to this -- and everything else -- is just another sign the Islamic State is living up to its name, said Ola Johan Kaldager. He's a retired intelligence officer who started E-14, Norway's equivalent of the CIA special operations team. "We are always talking about the Islamic State as a terrorist organization. But we have to talk about them as a state. It's a state now," Kaldager said. "They have their own economy, border control, customs, taxation. These make it very hard to get rid of them in the near future."